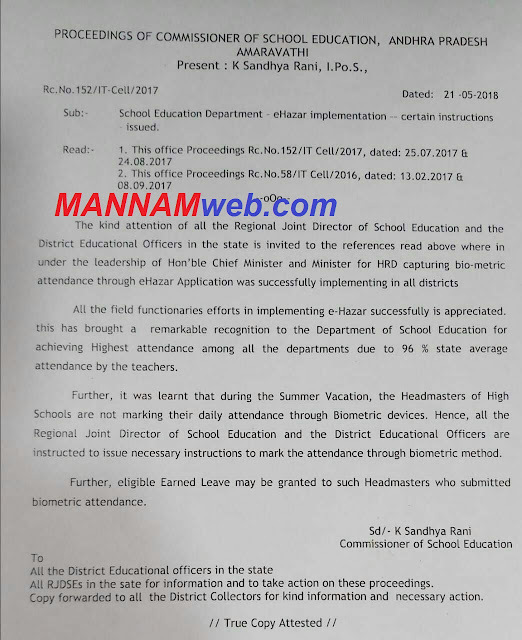 Sub: - School Education Department eHazar implementation -- certain instructions issued. All the field functionaries efforts in implementing e-Hazar successfully is appreciated. this has brought a remarkable recognition to the Department of School Education for achieving Highest attendance among all the departments due to 96 % state average attendance by the teachers. Further, eligible Earned Leave may be granted to such Headmasters who submitted biometric attendance.